We know breast cancer is terrible. For the vast majority of people, we either know someone that has had breast cancer or know someone that has been affected by it. I think the awareness ship has sailed. Call it Support Month, or Fundraising Month, or More Important Than Other Kinds of Cancer Month, but let’s not fuzz this – we do not need an Awareness Month for breast cancer. To be perfectly honest I’ve got a little bit of bitterness when I see the pink ribbon everywhere. The reason is that October is “awareness month” for a host of other things that no one talks about – things that awareness really does need to be raised for. 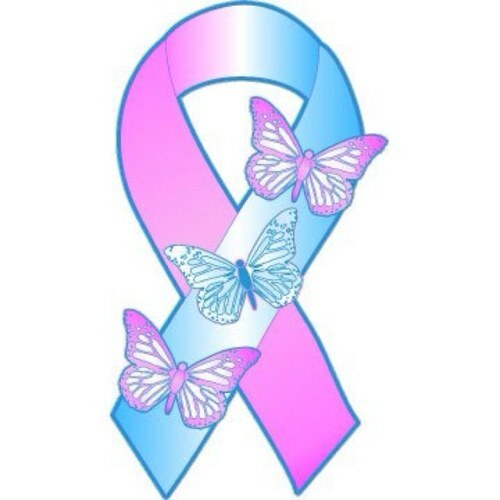 The pink ribbon has wound through my life, but nearer to my heart is the pink and blue. When I’m talking about the questionable nature of pink awareness ribbons, I mean that if you see a pink ribbon, you know what it’s for. That means it’s done its job. Time to move on. Are you aware of the pink and blue? You don’t see them around much. A number of issues fall under their purview, but for October they symbolise pregnancy and infant loss. Are you aware of that? Do you actually know the number of people in your life who have had their hearts hammered by a miscarriage? Do you know the extent of the damage it does to relationships? Do you know how it can cause a woman to mistrust or hate her own body? Are you aware that it’s a BIG FREAKING DEAL? Today, October 15th, as I’m writing this, is the specific day held out for remembering those children whose lives were far too short, many of them never seeing the light of day or having the opportunity to breathe air before passing on. I’m aware that in the eyes of many people, they weren’t really people, or not even considered “life” to lose their lives. Most often, I just have to ragequit conversations with them, because nothing I say is going to make them understand that a miscarriage is more than just a loss of hope, or a shift in plans, but losing a child who was part of our life for way, way too short a time. Six times we’ve had early miscarriages, my wife and I. One of those times I got to hold my… I don’t even know how to date it… 7 weeks from conception daughter in my hands and look into her eyes and touch her tiny, tiny fingers. When I see people posting or saying or picketing to say that she didn’t matter, it makes me want to throw things at them. Or throw them at things. But this was never intended to be a pro-life-centric post, so I’m going to take a deep breath and move on. I don’t want to belittle the pain of those who have lost children to SIDS or post-birth complications, but I’m not going to be talking about them. There are two reasons for this: the first is that I’ve never experienced that, and as much as it pisses me off when people spout off about things they don’t understand, I don’t want to be hypocritical. The second is that it seems from the outside that people in general have a better understanding of the grief of that loss. It’s real to them. They don’t really understand the fullness of the impact of it, but neither do I, and there’s a lot of posts today from people that do and I’ll leave it to them to explain it. It’s loud. There is often shame associated with it. Self doubt and recrimination follow along. It strikes at the core of a person’s self-esteem. The inability to form and/or carry a child to term strikes at the core of gender identity and personhood. That’s one of the many reasons that people don’t talk about it. We don’t talk about the things that shame us. We shove them into dark corners to fester, then pull them out late at night and pick at them, alone. In the midst of this, we feel like maybe we shouldn’t feel that way. We don’t talk to people about it for fear that they’ll judge our feelings as much as the circumstances. Like it shouldn’t be as big a deal as it is. The fact is that people don’t understand. It’s hard to explain unless you’ve been there. It’s hard to see that the silence of the many, many women – couples – that have miscarried, isn’t because it’s too small to mention, but because it’s far too big. We don’t talk about it. We suffer alone, and our suffering is made worse by the feeling that we are alone in it. I look across my facebook feed today, though, and I’m not alone. I see that the things my wife has shared from her experience are giving voice to many women that feel the same but don’t have the words to express. I’m so proud of her. I’m proud of her strength, while I watch her still carrying the pain, sometimes walking along the edge of breaking from the loss of JJ, Anastasios, Sayuri, Aliento, Tacey, and Nima. It’s a big deal. We don’t just grieve the loss of a future, we grieve the loss of people – children that were part of both of us.